- There are no limits on individual purchase. Become a personal sponsor and participate in a racing team run by fans!! 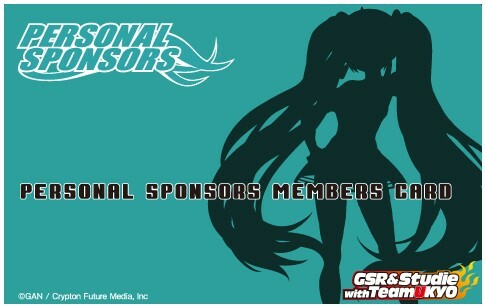 With our Hatsune Miku car competing in the Super GT - Japan's grand touring race series - GSR&Studie with TeamUKYO are now recruiting personal sponsors. *Available only for those sponsors who register their handle name when applying. Registration is open until Fall 2012. *Exact closing date to be announced. -Personal Sponsor Cards will be sent via airmail. -Personal Sponsor Cards and Ticket Holders will only be issued 1 per person. Please understand that if you have already placed a Personal Sponsorship order for this year's series, future orders will not contain a Personal Sponsorship Card or Ticket Holder. A Personal sponsorship allows all the fans out there to participate and provide support, for a patronage of small amount. We started this sponsorship option for Japanese fans in 2008, and last year we finally reached over 10,000 Personal sponsors. A total of 16,056 people gave us their support. In 2012, we plan to accept support from fans overseas as well. We'll be continuously releasing figurines, fan goods, and other special merchandise as part of our sponsorship options. Keep an eye out for them!